Photo: Provine House, ca. 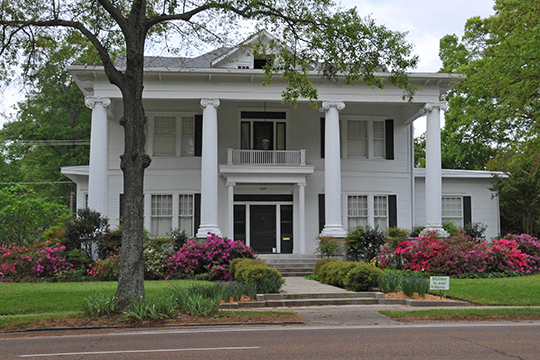 1910, 319 Grand Boulevard, Greenwood, MS. Listed on the National Register of Historic Places in 1980. Photographed by user:Jerrye and Roy Klotz, MD, 2008, (own work) [cc-by-4.0 (creativecommons.org/licenses/by-sa/4.0/)], via Wikimedia Commons, accessed November, 2015. The Leflore County Courthouse is located at 310 West Market Street, Greenwood, MS 38930; phone: 662-455-7945. Established in 1871, Leflore County was named for Greenwood Leflore, a Choctaw Indian Chief who was a signatory to the Treaty of 1830 by which the tribe sold all of their lands east of the Mississippi River.